Manchester United showed there is life after David Beckham with an impressive victory over Celtic in the opening game of their pre-season tour of the United States. Ruud van Nistelrooy, Ryan Giggs, Ole Gunnar Solskjaer and debutant David Bellion each scored to give the Premiership champions an ideal result in their first appearance since Beckham left for Real Madrid. "Celtic made it difficult but there was a good energy about us and our finishing was terrific. The goals were marvellous," said United manager Sir Alex Ferguson. Ferguson was also full of praise for Bellion. "For any young lad of 20 to make his debut and score is exciting. "I hope he develops - he has quite a bit to learn but he has good enthusiasm. "He's lightning quick, his control is good but he has to develop parts of his game. "You want a competitive element through the club and have so many players competing for a first-team place. "There are no guarantees at Manchester United. If you perform well it gives me the decision of what to do with the team." In front of a record 66,772 crowd at Seattle's Seahawks Stadium, Van Nistelrooy began the rout in typically deadly fashion. He received a seventh-minute pass from Solskjaer before firing a left-footed shot past Celtic keeper Magnus Hedman. United captain Roy Keane brought down Stilian Petrov in the area after 18 minutes but Alan Thompson missed the penalty for the Scottish side before United took complete control. 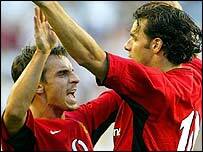 Dutch forward Van Nistelrooy turned provider for Giggs for United's second on 29 minutes. Solskjaer - filling in well for Beckham on the right flank - then swept home a right foot shot to give United a 3-0 lead six minutes before half-time. Keane was replaced by Juan Sebastian Veron at the interval as both teams began to introduce their substitutes, and United lacked their earlier sharpness until Paul Scholes and Bellion came on. Scholes fed his new team-mate and, despite looking offside, the former Sunderland player slotted home from an acute angle with 18 minutes remaining. "Both teams played with great enthusiasm and honesty"
"Celtic had no answer to Van Nistelrooy"